By Suzanne Chiodo. Published by Irwin Law. 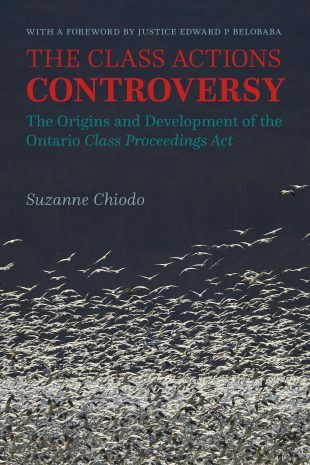 This book is a historical study of class actions in Ontario, from the origins of representative proceedings in equity, to the rise of modern-day class actions around the world (particularly in the US and Québec), to the debate and passage of class proceedings legislation in Ontario. This is the first in-depth analysis of the history of the Class Proceedings Act and the political and social influences that shaped it, and the first examination of the historical record underlying the CPA. The Act remains one of the most frequently debated procedural mechanisms of its kind. The CPA came about following the release of the Attorney General’s Advisory Committee (AGAC) Report in 1990. None of the current narratives explain how this Report pulled together so many divergent interests where previous attempts had failed. This book answers that question with reference to the legal, political and social environment of the time.